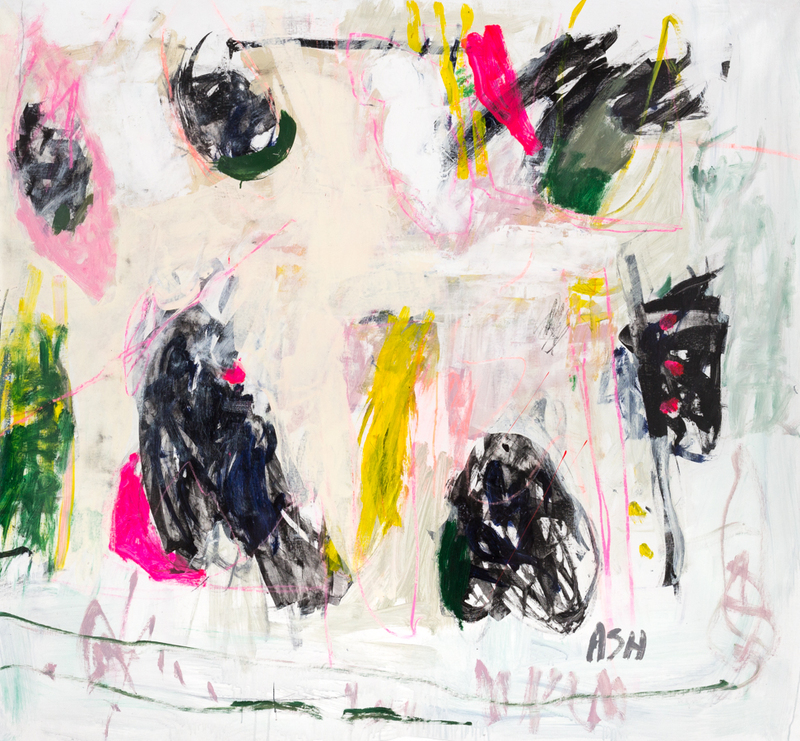 California-born and world-traveled abstract expressionist, Ashley Andrews, discusses in an interview with Merritt Gallery & Renaissance Fine Arts her creative process of mark making and the varied inspirations behind her work. The Abstract Expressionism movement. 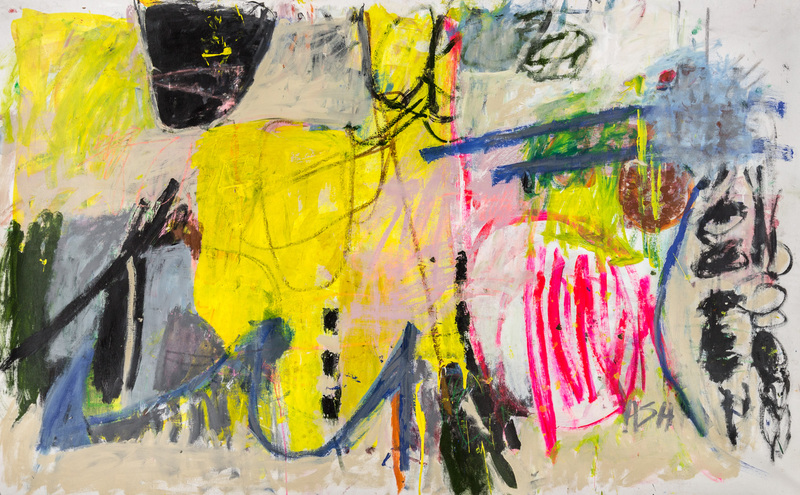 The bold colors, the abstracted women of de Kooning, the writing of Basquiat, the political silkscreens of Rauschenberg, and the scribbles of Twombly. They inspire me because they all broke the mold of Impressionism, and set art free to become whatever the artist’s hand wanted it to be. Andrews, “Handwriting,” Acrylic on Canvas, 48 x 60 in. I like to paint on large, unstretched canvas, pinned to the wall. I roll out almost the whole roll of canvas and mark off about five sections to produce a body of work, similar in mark making and color. This way, I can go back and forth and not focus on just one painting. This has a long tradition, from Bonnard to de Kooning. My whole concept of painting is mark-making. I like marks and shapes and I juxtapose them into a overall composition. Sometimes the marks start small…I put them down, paint over them, put a large wash of a rectangle shape over them, re-introduce them on top, etc. So I would say, each painting is eclectic and different from another one. I draw on the canvas for an initial composition. 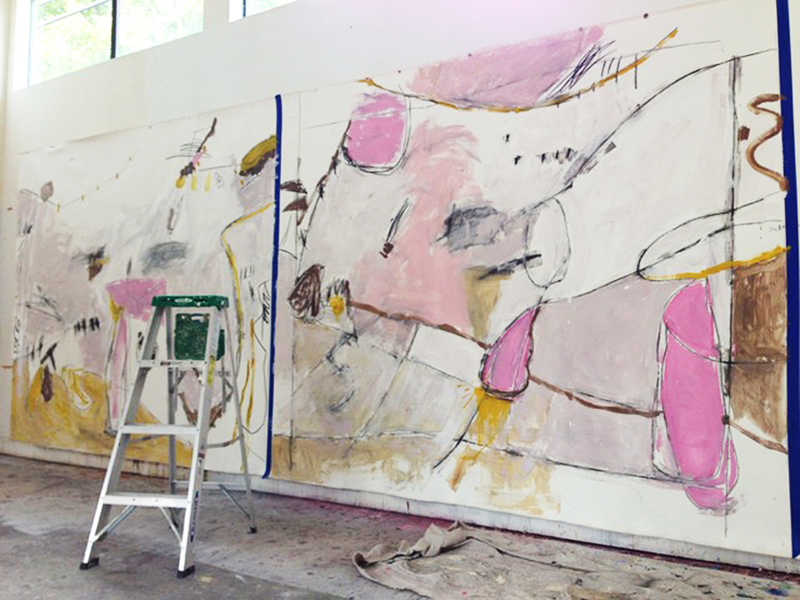 Then I pick a paint color, often times pink, and I start laying down shapes. Then I just let the painting and the more formal considerations take over. Andrews, “Tara,” Acrylic on Canvas, 56 x 61 in. I think about the colors of the places I have visited and I am always thinking about the Ocean. I grew up in Santa Monica, California and spent half my life looking at the surf and swimming in the water. I produce a lot of blue paintings, thinking about the ocean, using it as an overall wash. I also look at the mark makings of other artists for inspiration. For example, Basquiat used the crown, which I sometimes place in my art as an art historical reference. Warhol painted flowers, and I will put in a similar flower as a nod to him. I often scribble charcoal lines thinking about Twombly. De Kooning used many shapes, which I try to incorporate with my own mark-making and compositions. I am aware that Conceptual art is the flavor of the day, but I identify more with action painters like Pollack, Sam Francis, Joan Mitchell, Helen Frankenthaler and Lee Krasner. 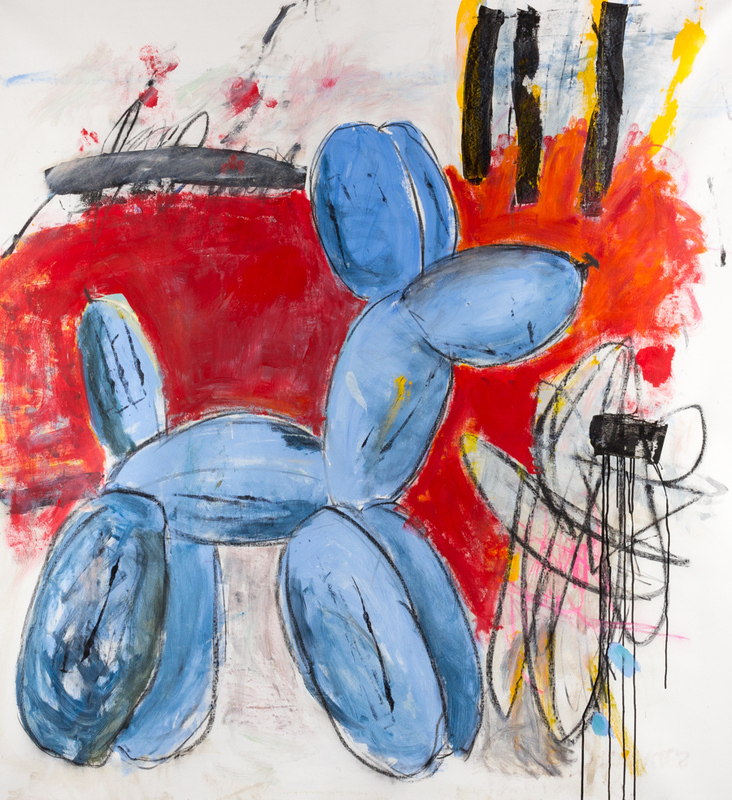 Andrews, “Je Suis Balloon Dog II,” Acrylic on Canvas, 66 x 60 in. What do you strive for in creating your artwork? I strive for beauty, balance, trying to quiet the riotous parts of the painting that seem to multiply. I love the process of painting, and hope to be able to tighten my work up a bit more in the future. Ashley Andrews is a recipient of many awards, and has been gaining a steady collector base with return buyers. 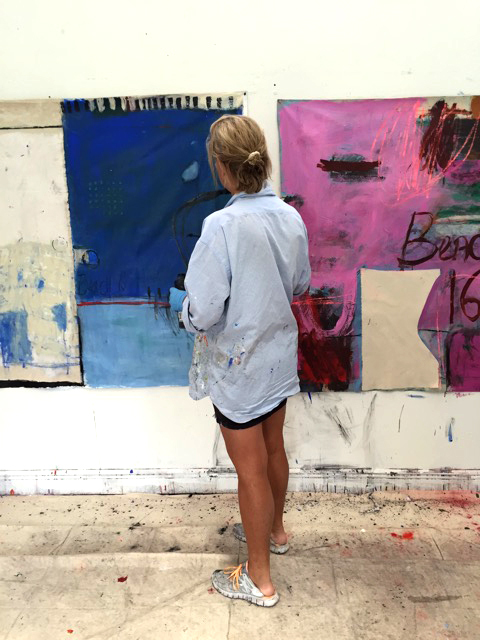 She is currently gaining traction and has six galleries in the United States.